Sir William in the House!!!!!!! LYC!!!!!!!! There are many different types of Rays some can shock, some can kill with barbs (stingrays), and some are just normal plain rays. these rays can be found in many different areas (places of the world). These many places must have tropical (warm waters). Though many are found in the ocean you can find some in fresh water (usually brown and more circular in shape). The two main continents where you can find these animals are Africa, and South America. The reason for that is because these continents are always warm and have plenty of water sources.(_____.6). There are two main traits to tell if it is fresh water or salt water. If the nose is pointed it is usually fresh water because it uses it for burring itself in the mud. Also another trait is that if it has a flatter body now that is not always the case (for example the atlantic stingray). 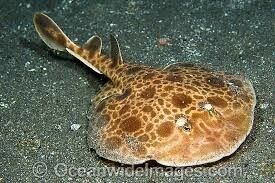 The reason stingrays of all bury themselves is so they can sneak on prey or hide from predators (be concealed). 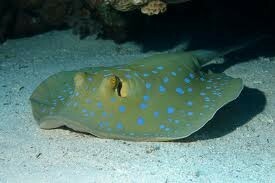 Stingrays in truth have really bad eye site , so how do they get their food if they can't see. It is a thing called electroreceptors these little receptors pickup electric pulses in the water to find if something is in the water.They can tell the animal by the movement of the pulse comes from and where the animal is.Stingrays eat with a moth that is basically on their stomach. but if they are buried how do they know that a meal is overhead if they can't see. What do they use Electroreceptors(_____.14).Some of the animals that the stingray eats are the many crustaceans (crabs), mollusks,,small worms, and clams. Now these animals are not at the top the food chain(______.20). Now the stingray don't have tooth brush after the meal so what do they do they call on fish that dine on parasites and bacteria on the ray after the rays adventure. 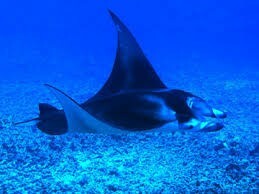 Rays are very magnificent creatures, but can be harmful so avoid them but also cherish them with your heart.